I made this recipe over the weekend, and was shocked at how easy it was! They came out delicious too, and everyone has really enjoyed them. I also made some cinnamon & sugar roasted pecans & almonds this weekend as well - and I gotta say, nothing is funnier than saying "would you like a ball or a nut?" Hehe! Yes, I'm a child. Pulse cookies in a food processor until they're all crumbles. Add cream cheese and pulse until it forms a dough. Microwave the almond bark in a bowl (start with low heat), and stir until smooth. 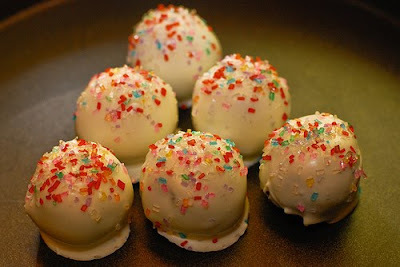 I had trouble with the "dipping" process, but after a few different attempts realized that the best way to do this would be to drop each ball into the chocolate, flop it over a few times with a spoon, then scoop it out and set each back onto the wax paper. Get the sprinkles on top before the chocolate hardens, then pop 'em in the fridge! YUM! Ho Ho Hoes VS The Grinches Bout!